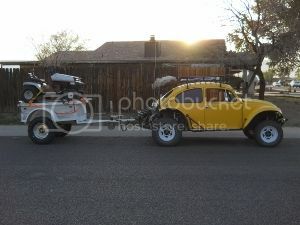 AzBaja.com, Home of the VW Baja Bug -:- Baja Forums -:- Off-Road & VW Based Clubs (4x4, ATV, Jeep, Motorcycle) -:- Events and Get Togethers World Wide -:- Presidents' Day? Baja Forums -:- Off-Road & VW Based Clubs (4x4, ATV, Jeep, Motorcycle) -:- Events and Get Togethers World Wide -:- Presidents' Day? i just wanna thank everyone who came out. yes it rained, it was damp but no dust. my 16 month old grandson had no idea where he was but was having a great time. my daughter and husband showed up , a friend and his wife from work came out, tent camped along with troy and denise. I found out later that a couple other people were out there but not in our camp area. sorry those of you missed a fantastic time due to the rain, but remember, it does not rain everywhere all the time. Dang! bet you all had a blast! Finally got my clynder heads checked out. One is rebuildable but my second one would cost almost $500 to rebuild! be better off just buying a new one. What really bugs me is that buissnes claim to be air cooled professinols and don't even have the proper tools to work on them. Anybody know a reputable air cooled machinest that can replace valve seats? one told me once you weld alunimin it turns too soft!?! That's why they have different alloy rods! So fustratedright now. Also sorry for the rant, but wheres the pic's and video? Post subject: Re: Presidents' Day? My rail or bug were not running had to miss it. I got the rail going this weekend despite the rain. Going to take it our by Morristown this Sunday and test her out, if anyone wants to come let me know. going up to Lake Pleasant this weekend if you want to join us.